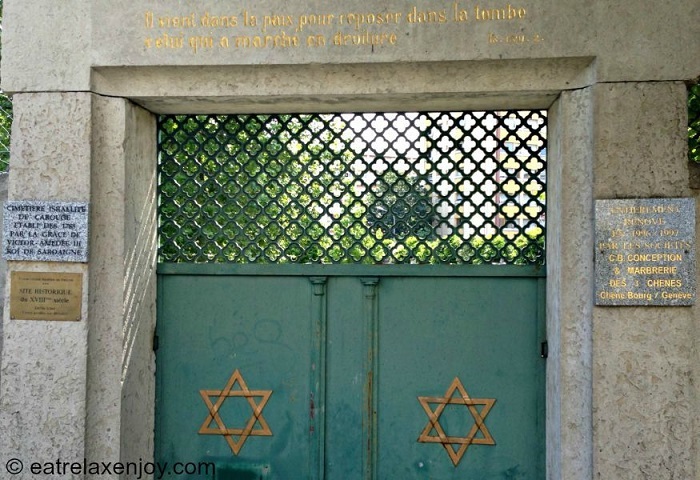 A circular Geneva walking tour of half a mile up to a mile starting by a walk along the Arve River, a peek into the old Jewish cemetery, continuing to the center of Carouge – the market square and surrounding streets and ending at the starting point. 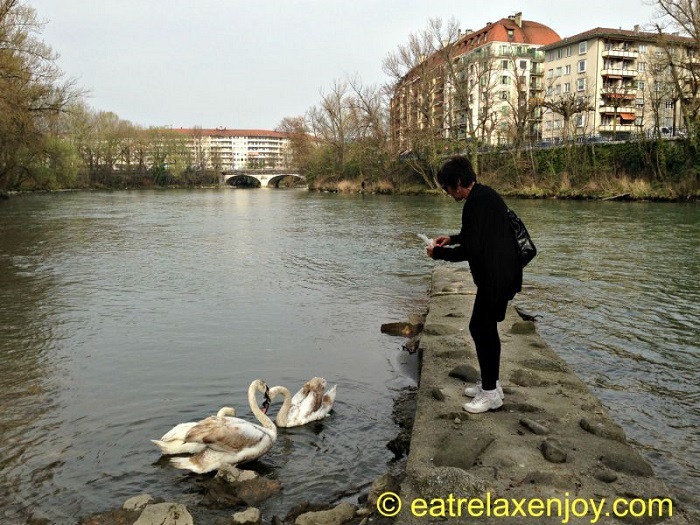 Most of the places in this route can be approached directly with a car, but part of the fun is the walk along the river and into Carouge center. 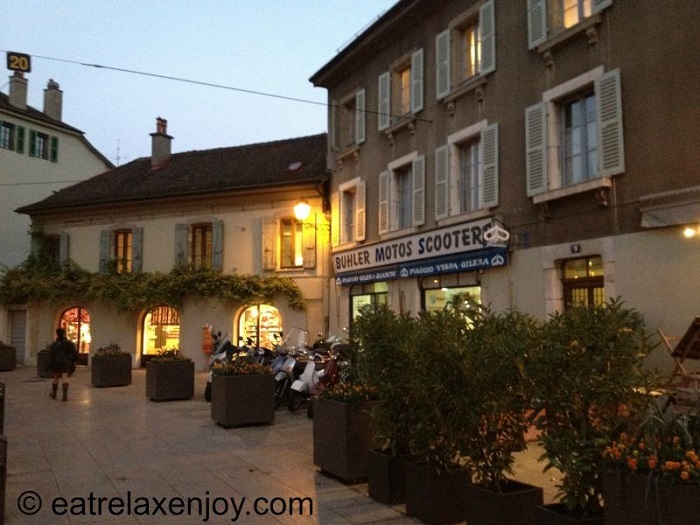 The tour is best done towards the dusk so that Carouge will be seen at night. Carouge stretches over a little less than 3 square kilometers. It used to be an independent french colony until in 1816 it turned into a part of Geneva/Switzerland. It is like a rural town with beautiful low buildings and a center of galleries and entertainment. In the middle of Geneva, you’ll find yourself in a romantic French-Italian town with squares and fountains. 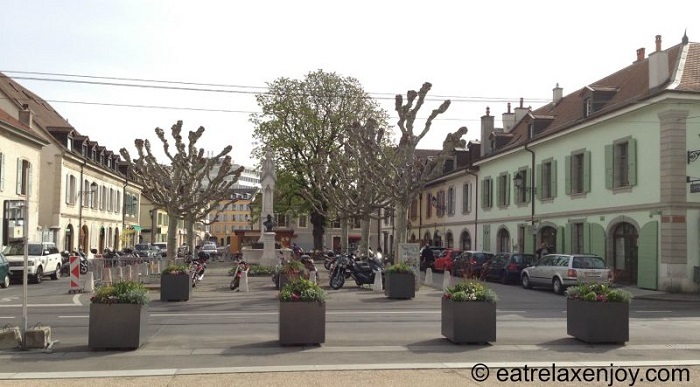 Carouge is located a little south of Geneva city cneter, about 15 minutes drive in a trolley and is bordering the Arve river in its Northeastern side. We’ll start our walk in Place de L’Octois. Here’s the map of the tour. 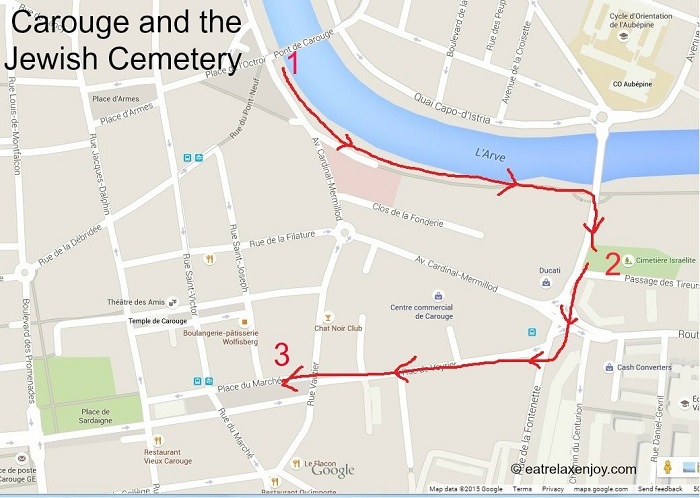 Number 1 is Ponte de L’octios, number 2 is the old Jewish cemetery, and 3 is Carouge market square. If it is morning and you haven’t had breakfast (or it is the afternoon and you want something sweet), you can buy French pastries here. There’s a good selection of coffee shops. I recommend crossing the bridge to Rue de Carouge, there, in front of the Blanche tram station, there’s a really good coffee shop Le Sait Honore (it says Boulangerie Patisserie above the entrance) – their croissants are delicious! I used to walk there every morning when I stayed with a family member who lives nearby. She said it is the best local place for croissants. I’m sure ther are others, but I tried this one and can recommend it (and it was open on weekends too!). 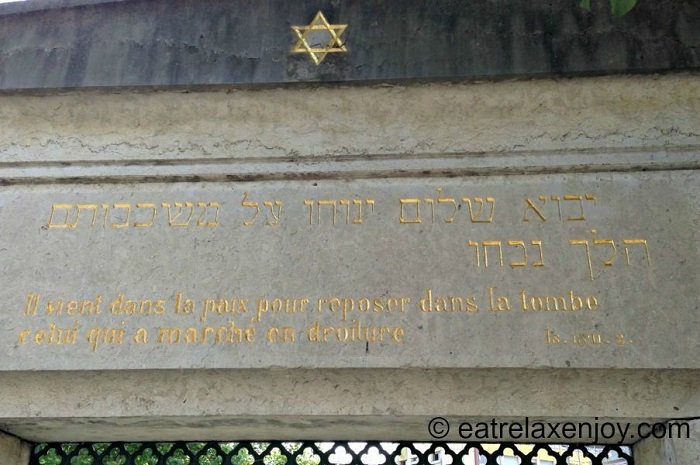 If you are using a navigation system or Google Maps, our destination is Cimetiere Israelite on Rue de la Fonette. We’ll walk on the road along the river until we see the entrance to the garden going down/left along the river. You can go down fromt he path right by river (if you get there in the early morning or afternoon you’ll see the locals walking their dogs there), there’s nice natural vegetation, ducks and swans. You might want o bring some left overs to feed them. Continue there until you reach Rue de la Fonette. Cross the street and walk a little bit right. You’ll notice the green gate with the cemetery text. You can peek through the fence and see the graves. Here’s a closer look at the gate. 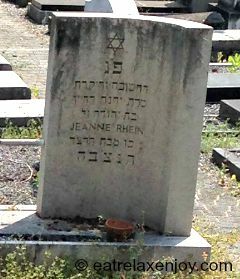 And a closer look on the text, “may you rest in peace in front of him” (my translation). The text in French explains that it is a historical site; established 1788. The cemetery is full and is closed for burrial since 1920. 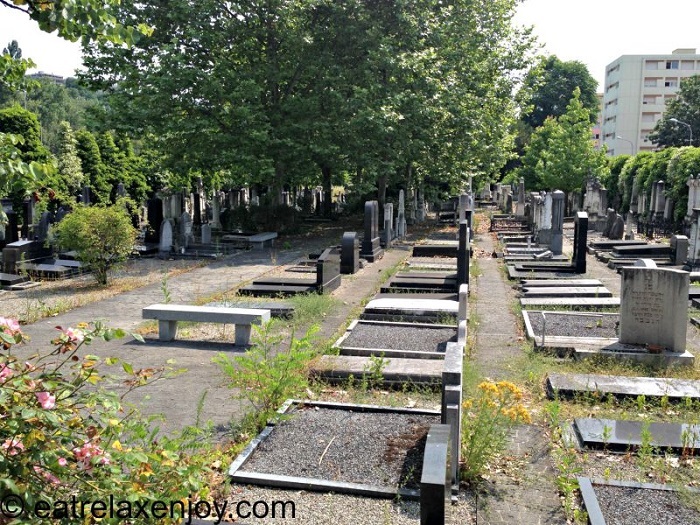 In the old days, it was not possible to have Jewish burial in Switzerland since the law did not enable separate cemeteries (and other Jewish traditions). 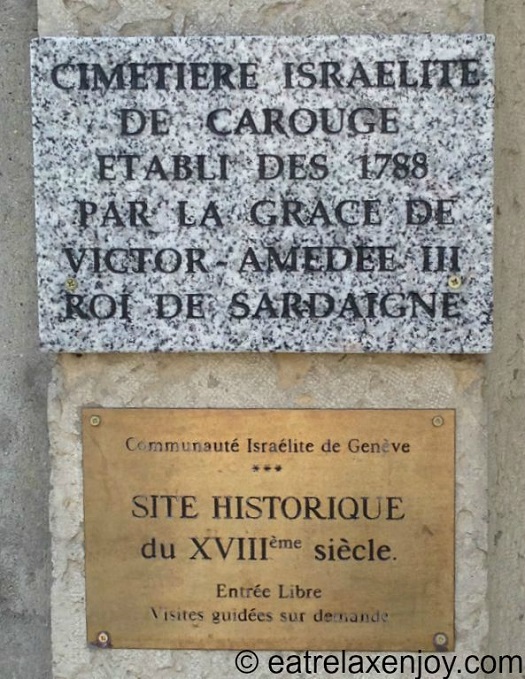 Carouge was then part of Sardinia (and later on of France) thus, the Jews were buried outside Switzerland. The cemetery is normally closed and visiting needs coordination. You can still see the internal part with the graves from the street when you look above the fence. and the writing on one of the graves that I was able to close up on. Let’s go back to the tour. We’ll continue to Place du Marche – the market square. We’ll cross the street back and walk towards the center of Carouge via Rue de Veyrier. Look at the houses. At the beginning, they are more industrial style, a bit square and remind the Communist style. hen, it changes to the old French style – 3-4 stories buildings mostly, with square balconies and shutters. The market square stretches in front of the Church with two lines of trees leading you towards it. 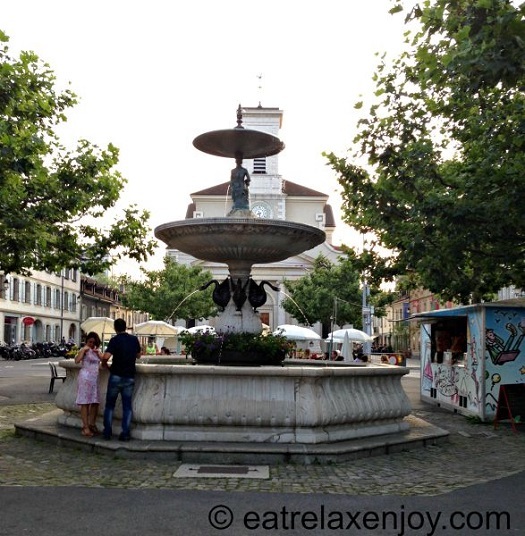 Walk freely around the center of Carouge and the side streets – it is all full with coffee shops and restaurants, entertainment venues and small galleries. Do not miss the theater and the Temple. 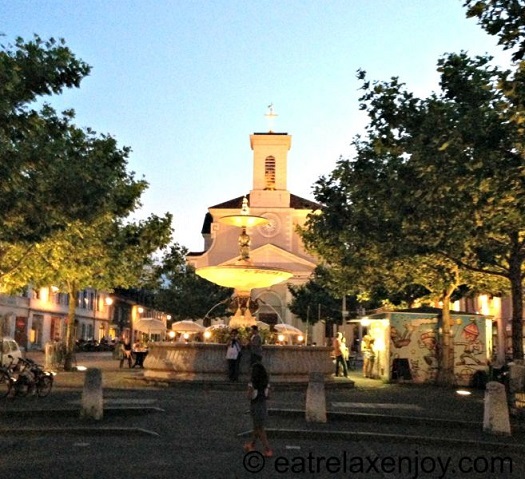 IF you are there in the evening, wait for darkness, Carouge is lovely at night! here are some pictures to give you the sense of it. It is really pretty and romantic. After you finish walking around the market square, you can take a tram back from one of the streets around it, or walk to the starting point, Place de L’Octroi. 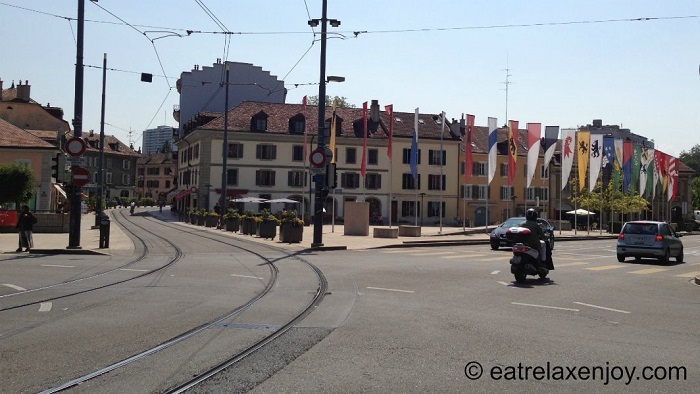 Another nice place to visit in Geneva is The magnificent river junction. 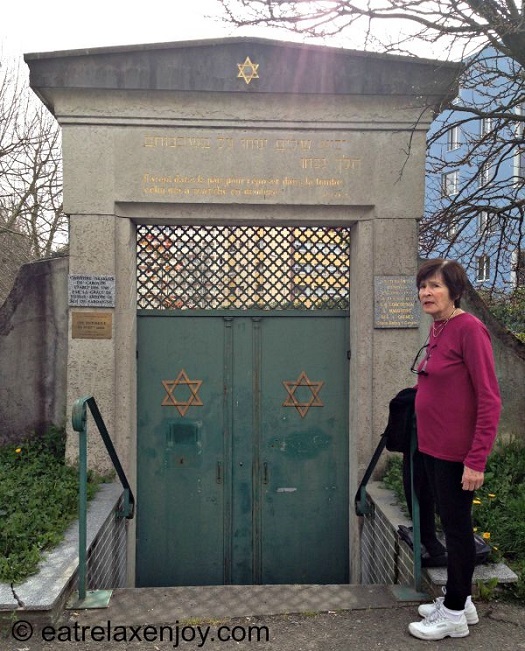 You’ll find more about Europe and about Travel, Jewish stuff and about Israel.